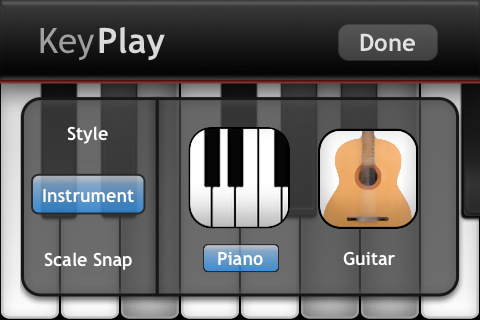 KeyPlay is a music app that gives you the power to turn your iPhone and iPod Touch into a piano or guitar. The app was released by Ice Media Creative and costs $0.99. Using KeyPlay you can wirelessly play into the GarageBand app on your Mac from your iPhone. The wireless playing also works with any other Mac app that supports the CoreMidi protocol. The piano is not generally thought of as a hip instrument, especially in the 21st century, but I have always loved it. I am automatically drawn to any kind of music that incorporates piano playing like classical music or classic rock. When I caught wind of KeyPlay I have to admit I was a bit skeptical because apps meaning to turn your Apple device into an instrument that I have encountered in the past have completely disappointed me. The sound produced by KeyPlay is so precise that there is no difference between tapping on your screen and playing a piano, however. There are 8 keys listed at a time, which you control by sliding a transparent sheath across the full set of keys on the top portion of the screen. In Options you can choose to play a classic or retro piano or a guitar. 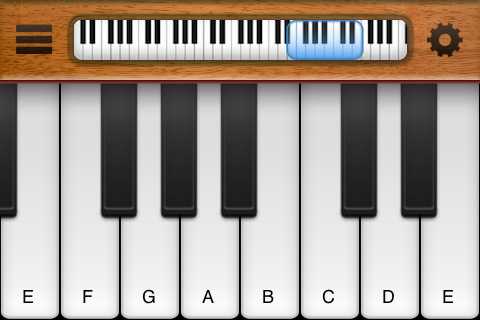 You can also have the notes listed on the keys so you know which ones to play if you are toying around with the app in an attempt to teach yourself piano. There is a scale snap so you can tune the piano or guitar before playing. Another feature is the Pitch Shift which lets you choose a pitch (1-12) and whether you want the pitch to shift up or down. The only difference I noticed between playing classic and retro is that the sound that comes from retro has more of a twang and retro is made up of wood paneling, while classic has that black-painted wood. I cannot express enough how happy I am with KeyPlay; it is quality and bargain tucked into one nice little package. Pianos and even guitars are incredibly expensive, so as much as it is sad to see technology taking over the experience of touching the actual keys of a piano, I love that KeyPlay has provided the less privileged lot, like myself, with an opportunity to tap away on some ‘keys’ for hours on end. AppSafari review of KeyPlay was written by Vanessa Paszterko on February 16th, 2011 and categorized under App Store, Fun, Music, Remote, Utilities. Page viewed 4457 times, 1 so far today. Need help on using these apps? Please read the Help Page.